The staff at the Bar N Ranch is dedicated to the fulfillment of your visit to the American West. Your hosts, The Ledyard Family, invite you to make these two hundred acres your home while visiting Yellowstone Country. The Main Lodge of the Bar N offers a relaxed and welcoming atmosphere. The stunning three-sided rock fireplace in our Great Room is a fantastic backdrop as you gaze upon breathtaking views of LionHead Mountain. The Lodge is also home to the Bar N Restaurant where you may begin each morning with a full, country-style breakfast. We offer our guests rustic, yet elegant, cabins featuring small refrigerators, microwaves and coffee-makers. These amenities are complimented by a spacious living area complete with wood-burning fireplace. Each of our cabins is situated within a comfortable walking distance of our 9,000-square-foot lodge. All cabins offer guests the quiet comfort of a private, outdoor hot-tub and the two bedroom cabins boast an adjoining bathroom, complete with jetted spa tub. 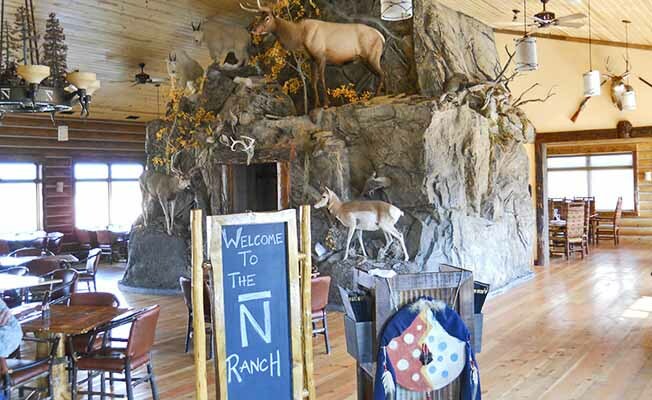 The Bar N Ranch is home to seven sleeping rooms, each unique in charm and offering a different view of our 200-acre ranch. While each room differs in design and capacity, they are faithful in providing a wood burning fireplace, jetted spa tub, small refrigerator and coffee-maker amenities we believe essential to your stay. Our remarkable full service facility is further enhanced by an outdoor heated pool, spacious hot-tub, and an exquisite gourmet dining experience.